What Alpha Security Product Do You Need? Security Products are a line of anti-shoplifting products that are very popular with retailers. While Alph Tags are frequently used for clothing security, they also provide security tags such as the Alpha Jewel Lok for jewelry and the Alpha Spider Wrap for packages, such as perfume and gift sets. Alpha Security Tags also work well for securing shoes. If you are not sure if there is an Alpha Security Product that will help you with your particular problem retail item, give Loss Prevention Systems a call at 1.866.914.2567 and we can help you find the best security product to stop shoplifting in your store. 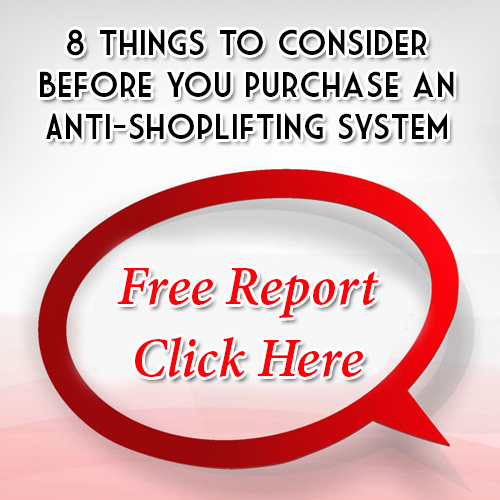 Retailers often do not understand the impact on profits that shoplifting causes. There are many layers of loss that are involved when a shoplifter is successful in your store. If you have a 10% profit margin on your products and you lose a $100 product to a shoplifter, you will need to sell $1,000 to cover the loss. Because you are only making $100 on that $1000. So essentially, even small losses can add up to a huge shoplifting impact on your profits. Shoplifting makes inventory more difficult. When you do not know items are missing, you might be out of something a customer wants to buy even though your system shows it is in stock. This means great, PAYING customers walk out of your store empty-handed and disappointed. Clothing security can be costly if you need extra people to monitor the dressing rooms. Having good loss prevention tools can improve clothing security and cut labor costs. You need to remember that shoplifters are criminals and if they think your store is an easy target, you are putting your employees and good customers at risk my mingling in a criminal element. While most of the time they keep a low profile, there are those cases where things can get violent or get out of hand. Anything you can do to discourage shoplifters from entering your store is going to create a safer environment where customers feel more comfortable shopping. With these measurable and intangible losses going on due to shoplifting, the cost of your security tags should not be an issue, because they are going to pay for themselves quickly when they prevent shoplifting. Any reputable dealer of Alpha Security Products or Checkpoint Security Products is going to only sell to verified retail establishments and also keep pricing private until the retailer can be verified. This is essential to keep shoplifting technology out of the hands of the shoplifters. However, this also makes it hard to shop for the best prices on Alpha Security products, such as Alpha Fashion2, Alpha 2Alarm, Alpha Nano Gate, Alpha 3Alarm, Alpha Jewel Lok, Alpha Shark Tag and Alpha Spider Wraps. Loss Prevention Systems does sell these products for less than the recommended retail cost and often includes free shipping on shoplifting prevention orders. However, you must call or register on our shopping site and be approved before you can access the cheap pricing. It is for everyone’s benefit that shoplifters cannot access the Alpha Security pricing or order the products. Give Loss Prevention Systems a call at 1.866.914.2567 to find out about the cheaper alpha security tag prices. Ultimately, yes you want to save money on security tags and get the best deal you can, but you also want to work with a Security Expert and get your retail anti theft devices in place as quickly as possible to stop shoplifting loss and make your store more successful. Installing a system will show up on your bottom line very quickly. Bill Bregar of Loss Prevention Systems is only a phone call away (1.866.914.2567). He has been a chief security officer for major companies as well as having a police and military security background. You can call him for free shoplifting prevention advice and he can help you decide if an Alpha Security System or a Checkpoint Security System is best for you, and which kinds of tags and wraps can help you protect your merchandise. Bill conducts workshops on clothing security and shoplifting prevention, as well as covering the difficult topic of employee theft and how to do better background checks. He is a true shoplifting prevention expert that will be your ace in the hole if you work with Loss Prevention Systems. Verified retail professionals can call Bill Bregar for risk free shoplifting prevention advice. Just have a conversation and if Loss Prevention Systems cannot help you boost profits with a Checkpoint or Alpha Security System, he will be the first to say so. But with over 30 years of loss prevention and security experience, it is a safe bet you are going to walk away with a plan to stop shoplifting and boost your retail profits.